As computers advance, encryption methods currently used to keep everything from financial transactions to military secrets secure might soon be useless, technology experts warn. Reporting today in the journal Nature, a team of physicists and engineers led by University of Texas at Austin physics professor Xiaoqin Elaine Li report they have created a material with light-emitting properties that might enable hack-proof communications, guaranteed by the laws of quantum mechanics. Their new material, created by stacking two layers of atomically thin materials, absorbs energy from light and emits new photons, or particles of light, in such a way that the researchers interpret the material to contain thousands of identical "single-photon emitters." If confirmed, such a novel light source could be used as part of a new, hack-proof method of securing information. Other researchers have created single-photon emitters, but no previous technology has produced an array of thousands of identical ones. "This is a long-standing goal in quantum information science that has never been demonstrated before," Li said. "Our studies suggest that this goal may be achievable in this new material." To communicate securely, information has to be encrypted before it is sent out. The receiver needs a key to decipher the encrypted message. In some forms of cryptography, the sender transmits the key one photon at a time. Because a photon contains the smallest packet of energy possible for light, it cannot be split into smaller packets. If a hacker intercepts the photons and tries to read the information, the key will change and the receiver will easily find out. That is why highly efficient single-photon emitters are useful in quantum communication applications and increasingly necessary, as advances in computing demand more sophisticated tools to keep communications secure. "If there is a missing photon, you know information is being intercepted," Li said. The materials investigated by the team consists of two-dimensional crystalline sheets that are only a few atoms thick. The method for creating such ultrathin atomic sheets is remarkably simple. Scientists use scotch tape to peel off individual layers from a crystal. By stacking two different layers on top of each other and slightly rotating them relative to each other, the scientists created an artificial crystal with a regularly spaced pattern of atoms. 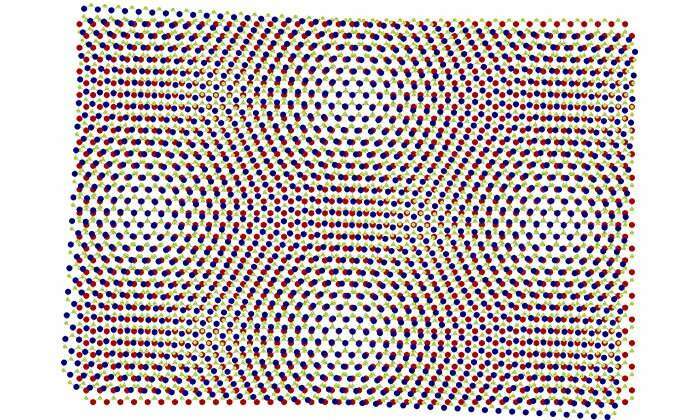 Such a pattern is known as a moiré crystal, which localizes electrons into a tight space on the order of a nanometer, about a thousand times smaller than a bacterium. The researchers have strong experimental and theoretical evidence that their new material forms a checkerboard array of thousands of single-photon emitters, but the resolution of their equipment has not yet allowed them to prove it conclusively. As next steps, Li and her team will collaborate with other researchers to verify that they are, in fact, forming single-photon emitters, while continuing to improve the material's quality.